After months of delays followed by an unusually slow jury selection process, the murder trial of East Peoria speakeasy operator John Petje finally got under way on Thursday, Dec. 7, 1933. On Friday morning, Dec. 8, it all came screeching to a very sudden halt. Tazewell County State’s Attorney Nathan T. Elliff called two witnesses to the stand that morning: William Peters, brakeman for the C. and I. M. railroad, and Engineer W. S. Kirkwood. Peters and Kirkwood operated the train that ran over Lew Nelan in the early morning hours of Sunday, Aug. 28, 1932. Nelan, along with two of Petje’s acquaintances, Frank Keayes Jr. and Edward Hufeld, had been drinking at Petje’s speakeasy on Saturday night. At the coroner’s inquest into Nelan’s death, Keayes and Hufeld testified that Petje and Nelan had fought, and that Petje struck Nelan on the head with an iron bar. According to their inquest testimony, thinking Nelan was dead, the three men took Nelan’s body to the railroad tracks nearby so he would be run over. Judge Joseph E. Daily then questioned Keayes as to where he was on the evening of Aug. 27, 1932. Judge Daily asked him why he refused, and Keayes replied, “I might incriminate myself,” availing himself of his constitutional right against self-incrimination guaranteed by the Fifth Amendment. Next, the judge called Hufeld and asked him the same two questions, and Hufeld responded in the same words that Keayes had used. With Keayes and Hufeld “taking the Fifth,” the state could not tie Petje to Nelan’s death. “Trial of the case developed that the state had little direct testimony and the court instructions to find the defendant not guilty came as little surprise to those who had been following the trial,” the Pekin Daily Times explained. Elliff’s attempted prosecution of Petje had followed a similar course as, and had collapsed in much the same way that, his prosecution of Sheriff’s Deputies Ernest Fleming and Charles Skinner had. In the case of Martin Virant’s death, Elliff dropped the charges against Deputy Frank Lee and then went on to lose the case when he and his fellow prosecutors were unable to tie Fleming and Skinner to Virant’s beating and hanging. In the case of Nelan’s death, Elliff dropped the charges against Keayes and Hufeld and then lost the case when he had no way to link Petje to Nelan’s beating and the dumping of his body on the track. Tazewell County’s residents had now seen the unraveling of the prosecutions in the cases of two related, very sensational homicides, along with fruitless attempts to oust the county sheriff and his deputies. These events helped to create a general sense of great dissatisfaction with the Tazewell County Sheriff’s Department and the State’s Attorney’s Office, and a debilitating loss of confidence in both elected offices. This inevitably would have notable political repercussions. Next week: Aftermath and epilogue. 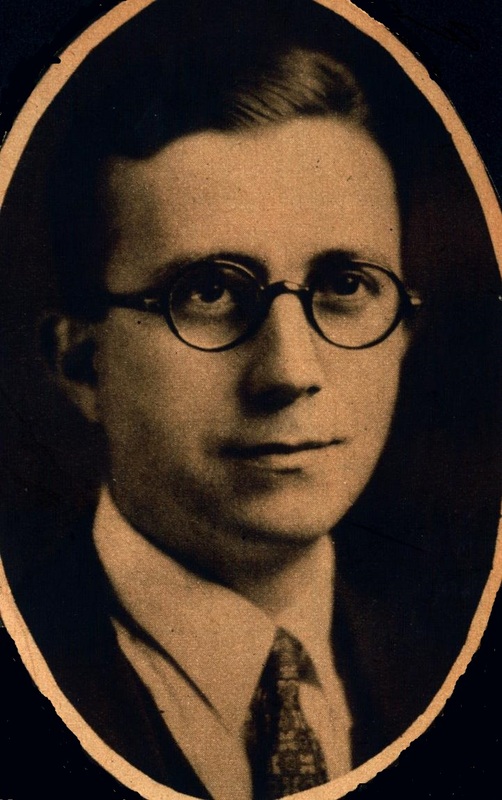 After months of delays followed by an unusually slow jury selection process, the murder trial of East Peoria speakeasy operator John Petje finally got under way on Thursday, Dec. 7, 1933. On Friday morning, Dec. 8, however, as reported on the front page of that day’s Pekin Daily Times, it all came screeching to a very sudden halt. In the autumn of 1933, more than a year after the gruesome death of Lewis P. Nelan of East Peoria, Tazewell County State’s Attorney Nathan T. Elliff took action to bring Nelan’s killers to trial. Nelan had gotten into a drunken brawl with East Peoria speakeasy operator John Petje, who struck Nelan on the head with a metal pipe and knocked him unconscious. Believing that Nelan was dead, Petje and his accomplices Frank Keayes Jr. and Edward Hufeld tried to cover up what had happened by carrying Nelan to the nearby railroad tracks so he would be run over. Nelan’s death on Aug. 28, 1932, had been overshadowed by the far more scandalous and sensational death of Nelan’s acquaintance Martin Virant, who had been brought in for questioning as a potential witness to Nelan’s death and then savagely beaten while in custody at the Tazewell County Jail. The furor over Virant’s death and the attempt to prosecute three of the deputies believed responsible was the focus of attention throughout the fall of 1932 and the winter and spring of 1932-33. After the deputies were acquitted on March 5, 1932, groups of Tazewell County citizens made attempts to oust Sheriff James J. Crosby and his deputies, but by September it was evident that the only recourse for outraged citizens was to wait until the end of Crosby’s term in office in 1934. That story reported on a very important development in the case: Elliff had decided to drop all charges against Keayes and Hufeld. Rather than accept yet another continuance in this case that had already been delayed a year and three months, Elliff moved to have the case against Keayes and Hufeld dismissed. Judge Joseph E. Daily granted the motion and then set the trial for the following day. Jury selection got under way at 10 a.m. on Tuesday, Dec. 5, but the process was unusually slow-going. Only four jurors were approved that day: Harold Ruth, Tremont, laborer; P. A. Barnes, Hopedale, garage proprietor; Carl Ary, Green Valley, truck driver; Irvan Kunkel, Pekin, mechanic. The next day seven jurors were accepted: H.R. Clayton, Cincinnati Township, laborer; R. D. VanNattan, Pekin, laborer; Clark Braden, Morton, machinist; Orin Aupperle, Morton, farmer; Albert Herman, Tremont, merchant; and David Hasty, Mackinaw, painter. The 12th and final juror was finally approved around 10 a.m. on Thursday, Dec. 7 – Edward Erxleben, Pekin, unemployed. Elliff and St. Cerny then made their opening statements, and the state began to call its witnesses at 11:30 a.m. The first witness was Hubert G. Brown, special agent for the C. & I. M. railroad, who had assisted with the investigation of Nelan’s deaths. It was Brown who had found Nelan’s hat near a rear door of Petje’s speakeasy very soon after Nelan’s body was run over on the P. & P. U. railroad tracks in East Peoria. However, Brown’s memory was much the worse after the 15-month delay since Nelan’s death, and when Petje’s attorney, James P. St. Cerny, showed him the hat, Brown said he couldn’t be sure it was the one he’d found. Similarly, Mary Peckenpaugh, who had identified the hat as Nelan’s during the initial investigation, told the court she wasn’t positive the hat shown in court was Nelan’s. The state next called Dr. L. F. Teter, who had conducted the autopsy on Nelan’s body, and former Tazewell County Coroner Dr. A. E. Allen, who had headed the death investigation. Teter and Allen testified that the injuries to Nelan’s head were not caused by the train that ran over him, but had been caused by a blunt instrument. The blow to his head was not enough to cause death, they also testified. Several other witnesses were called to the stand that day, including Tazewell County Sheriff’s Deputy Charles O. Skinner, one of the deputies who had been acquitted of manslaughter charges in connection with the “third degree” torture death of Martin Virant. Skinner told the jurors of his part in the investigation of Nelan’s death that had led to the arrests and indictment of Petje, Keayes and Hufeld. Court was dismissed at 4:15 p.m., and the trial recessed until Friday morning. Next week: A sudden ending to Petje’s trial. On Friday night, Sept. 16, 1932, the Tazewell County grand jury completed its inquiry into the shocking murder of Martin Virant at the Tazewell County Jail and the cover-up of his death, which deputies had tried to make look like a suicide. The next day, newspaper front pages throughout central Illinois announced the grand jury’s decision. These photographs of Tazewell County Sheriff’s Deputies Ernest Fleming and Charles Skinner were published in the 17 Sept. 1932 Peoria Journal following their indictment on murder charges in the beating death of Tazewell County Jail inmate Martin Virant. Soon after the indictments were handed down, the three accused deputies appeared in court with their attorneys, and each posted $10,000 bond and were released. Tazewell County Sheriff James J. Crosby immediately returned them to active duty. “Sheriff Crosby says that he sees no reason why the deputies under indictment should be dispensed with and they are still on duty at the sheriff’s office,” the Sept. 19 Pekin Daily Times reported. All three deputies pleaded not guilty when they appeared before Judge Niehaus on Monday, Sept. 26. Given the unusual publicity surrounding the discovery and investigation of Martin Virant’s death, “Counsel for the defendants, Jesse Black and W. J. Reardon are expected to ask for a change of venue when the case comes to trial, to some other county,” the Sept. 23, 1932 Pekin Daily Times reported. Meanwhile, the grand jury reconvened on Monday, Sept. 19, and took up the related case of the murder of Lewis P. Nelan, who was beaten and then left on railroad tracks in East Peoria to be run over. Virant had been brought in for questioning as a possible witness to Nelan’s death. “John Petji (sic), Edward Hufeld and Frank Keayes Jr., charged with the death of Lewis Nelan, indicted on charges of murder.” Petje posted 10 percent of a $15,000 bond on Monday, Sept. 26, and was released pending trial. Hufeld’s bond was set at the same amount, and he posted bail on Saturday, Oct. 8. Following the initial avalanche of front page stories and banner headlines during most of the month of September, reports on the Nelan and Virant murders became infrequent as the cases proceeded steadily through the courts. The next noteworthy development came on Oct. 19, 1932, when attorneys for the three indicted deputies gave notice of their intention to move for a change of venue. Next week: The deputies prepare their defense. Formerly an East Peoria police officer, in 1930 Charles O. Skinner was appointed a deputy sheriff by Tazewell County Sheriff James J. Crosby. During his time in law enforcement, Skinner had put his share of criminals behind bars. In a dramatic reversal of roles, on the night of Sept. 6, 1932, Skinner found himself behind bars – under arrest and awaiting arraignment for the murder of East Peoria miner Martin Virant, who had been found dead and hanging in his cell at the Tazewell County Jail on Sept . 1. 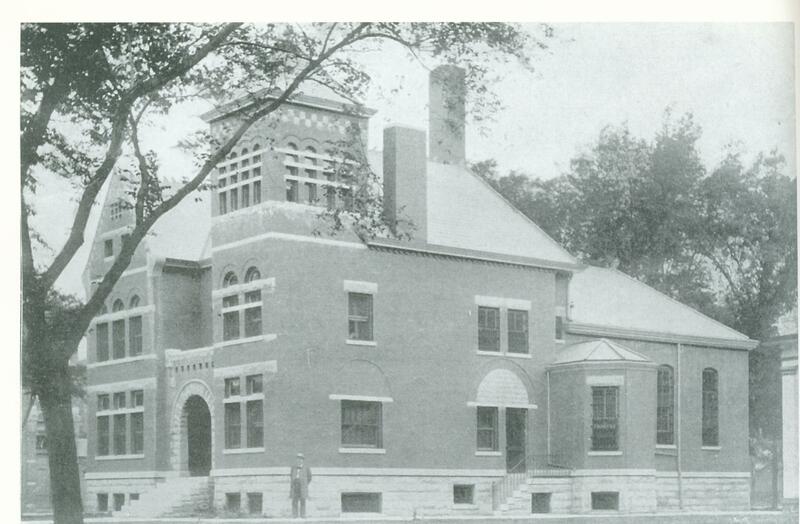 Shown is the former Tazewell County Jail and Sheriff’s residence, where Martin Virant was found dead and hanging in his cell on Sept. 1, 1932, the day after publicly accusing Tazewell County Sheriff’s deputies of beating and torturing him. The McKenzie Building on Fourth Street in downtown Pekin was built on the site of the old jail. Autopsies and a Chicago criminologist determined that Virant was already dead when he was hanged, and Skinner was accused of beating Virant to death while he was in custody as a potential witness to the murder of Lew Nelan. Upon his arrest, Skinner was taken to the Peoria County Jail as a precaution, due to the strong feelings that had been aroused in Pekin and East Peoria at the news of Virant’s murder. At 11:20 a.m. Thursday, Sept. 8, Skinner was arraigned in the court of Judge W. H. Williams. Not many noticed when Pekin Police Chief Ralph Goar brought Skinner to the courthouse, but the Pekin Daily Times learned of his arrival almost immediately because Goar stopped his car in front of the Times offices. The Daily Times that day reported, “There were but few persons around the stairway entrance leading to Justice Williams’ court this morning when Chief of Police Ralph Goar, Officer Harry Donahue, Attorney W. J. Reardon, counsel for the defendant, and Skinner arrived here this morning from Peoria, about 11:1 o’clock. Reardon then asked that Skinner’s bail be set at $5,000, saying that Skinner was not a flight risk. State’s Attorney Louis P. Dunkelberg responded that the question of an appropriate bail bond should await the findings of the coroner’s inquest into Virant’s death, which Dunkelberg expected to take place the following day (as it happened, the inquest would be delayed until the following week). Dunkelberg added, however, “that if the court felt it a duty to release the defendant on bond, he would not offer further objection. He did, however, think the bond should be placed at $30,000, and a $5,000 bond was grossly inadequate,” the Daily Times reported. Judge Williams decided to fix Skinner’s bond at $20,000, and Skinner posted bond shortly after and returned to active duty as a Tazewell County Sheriff’s deputy. “For the present Skinner will remain as a deputy, Sheriff Crosby said this afternoon,” the Daily Times reported. Also appearing in Tazewell County felony court that day was East Peoria speakeasy operator John Petje, who along with Frank Keayes Jr. and Edward Hufeld had been arrested for the murder of Lew Nelan. Later the same day, Martin Virant’s family at last was able to bury the body of their loved one, at 2 p.m. in Parkview Cemetery in Peoria. Virant’s funeral and graveside services had taken place on Sunday, but Tazewell County Coroner Arthur E. Allen had delayed burial so a more thorough investigation of Virant’s death could be completed. Virant’s family indicated that they intended to file a wrongful death civil suit against Sheriff J. J. Crosby and his deputies after Virant’s inquest. Next week: A tale of two juries. During the Aug. 31, 1932 inquest into the death of Lewis P. Nelan, witness Martin Virant of East Peoria shocked those in attendance with bold accusations that he had been severely beaten by sheriff’s deputies who refused to believe his protestations that he knew nothing of the fight that led to Nelan’s death. Virant had even shown some of his injuries to the inquest jury. He wanted to continue testifying about the torture he had endured, but because Virant knew nothing of Nelan’s murder, Tazewell County Coroner A. E. Allen sent him back to the county jail, expecting Sheriff J. J. Crosby to release him. Two other witnesses at the Nelan inquest who were not involved in Nelan’s murder, George Genseal and Burton Heller, were released from the Tazewell County Jail on Thursday, Sept. 1. Learning of Virant’s plight, his brother-in-law secured the services of Peoria attorney Victor Michael, who came to Pekin Thursday afternoon and told Crosby that if he did not release Virant he would initiate habeas corpus proceedings. “It was also reported that if Virnt’s release is secured he will be taken before physicians for examination and the X-rays will be taken of his injuries,” the Pekin Daily Times reports. Crosby granted Michael’s demand and, while Michael and Virant’s relatives waited outside the jail, sent Deputy Charles O. Skinner – whom Virant had named as one of his torturers during his testimony the night before – to let Virant out of jail. Chief Deputy Ernest L. Fleming telephoned Coroner Allen and told him Virant had hanged himself. Allen rushed to the jail. Fleming and Skinner led Allen to Virant’s cell, where Allen found Virant hanging by his belt from the top bar of the cell. Allen cut Virant down and his body was taken into the corridor and resuscitation was attempted without success. Faced with this sudden and extremely shocking turn of events, the Pekin Daily Times delayed its printing and hastily reworked its Sept. 1 front page so it could run a story along with its Nelan inquest story. The Times announced “VIRNT HANGS SELF IN COUNTY JAIL” – but by the time most Daily Times subscribers got to read those words, investigators were already casting doubt on the sheriff’s department’s account of how Virant had died. Considering the results of the Nelan inquest, Tazewell County State’s Attorney Louis P. Dunkelberg now prepared to prosecute John Petje, Edward Hufeld and Frank Keayes Jr. for the murder of Lewis Nelan. Also, on Monday afternoon, Sept. 5, Dunkelberg swore out a warrant for the arrest of Deputy Skinner for the murder of Martin Virant. Next week: Deputy Skinner issues denials. 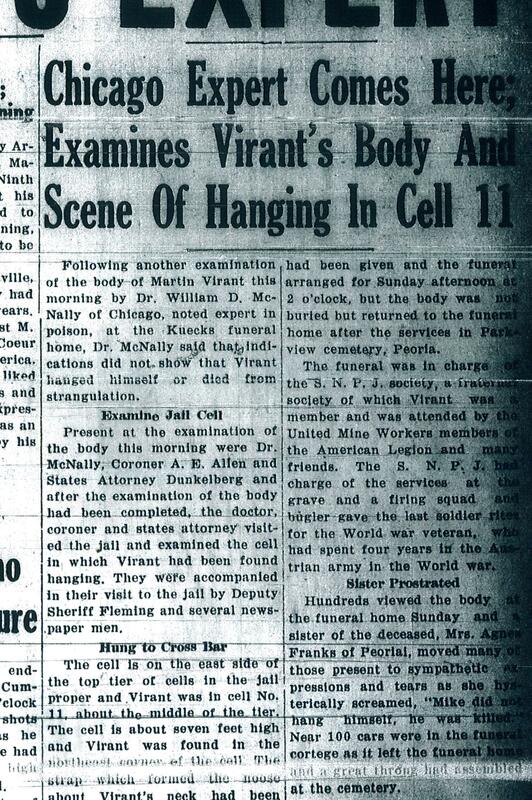 This front page article in the 6 Sept. 1932 Pekin Daily Times announced the arrival of expert criminologist Dr. William D. McNally of Chicago to examine the body of Martin Virant, found hanging in his Tazewell County Jail cell on 1 Sept. 1932. McNally concluded that Virant was already dead before his body was hanged in the cell. With this post to our Local History Room weblog, we revisit a series on a pair of sensational deaths that occurred in Pekin, Illinois, during the Prohibition Era. The Local History Room columns in this series, entitled “The Third Degree,” originally ran in the Saturday Pekin Daily Times from Sept. 15, 2012, to March 2, 2013. 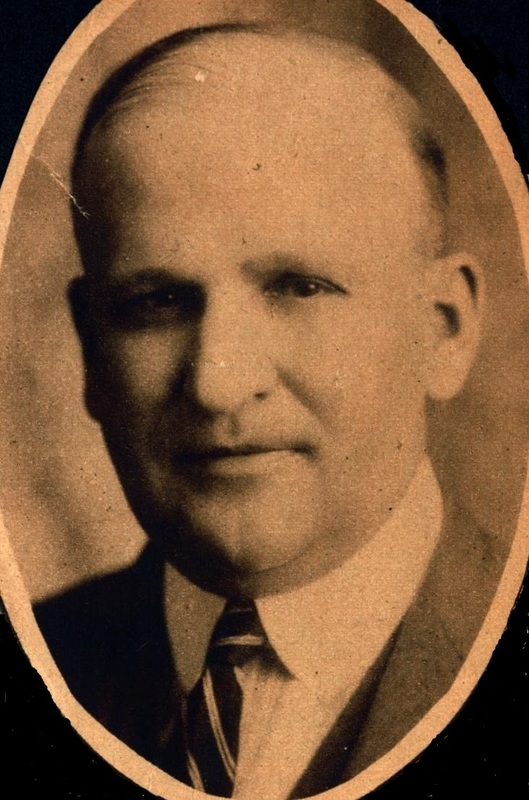 Early in the morning of Sunday, Aug. 28, 1932, Lewis P. Nelan was run over by a train in the East Peoria railroad yards. But evidence and eyewitness reports indicated that Nelan had not been hit while crossing the tracks, nor had he passed out on the tracks. So, how did his body get there, and how did he get those head injuries, the telltale signs of a beating? “We the jury find from the evidence that Lewis P. Nelan came to his death from injuries received when he was run over by a C. and A. engine in the P. and P. U. railroad yards at East Peoria on Aug. 28, 1932 between the hours of 1:30 and 4:30 a.m.
“We further believe from the evidence that said Lewis Nelan was struck on the head with an iron bar by John Petji and was placed on the P. and P. U. railroad track while unconscious by John Petji, Edward Hufeld and Frank Keayes Jr., for the purpose of covering up their crime, they thinking that said Lewis Nelan was dead from the injuries received when struck with the iron bar. The investigation of Nelan’s death had led the deputies to Petje after they found Nelan’s hat, which had holes in it indicating the wearer had been struck, lying on the ground just six to eight feet from the Petji’s speakeasy. Mrs. Peckenpaugh, Nelan’s landlady, told the deputies that the holes were not in the hat when Nelan had left home on Saturday. The deputies then brought in Petje, Keayes, Genseal and Hufeld for questioning, along with Burton Heller, 20, of Peoria, and an East Peoria resident named Martin Virant, 37. “Genseal was with Keayes, Hufeld and Nelan, but left the scene and had no part in the fight or disposition of Nelan’s body,” the Daily Times reported. After the fight, Heller had “taken Keayes and Hufeld to Peoria in his car, simply as a matter of accommodation and he knew nothing about the fight or other incidents connected with it.” Genseal and Heller were released Thursday morning following the Nelan inquest. Petje admitted to deputies that on Saturday he let in Keayes, Genseal, Hufeld and Nelan, and “they had several drinks,” but he denied there was a fight. 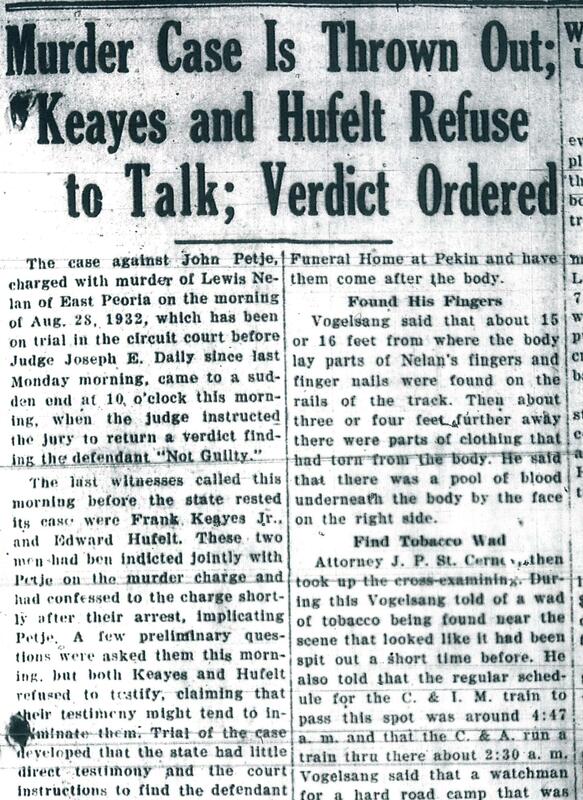 However, as reported in the Sept. 1, 1932 Pekin Daily Times, Keayes, Hufeld and Genseal told the investigators that “Nelan and Petji quarreled and Nelan was put out. Petji followed Nelan outside and the row was continued. Petji struck Nelan several times with his fist then picked up an iron bar and struck him over the head, Nelan falling to the ground. Petje, Keayes and Hufeld took Nelan’s body to the railroad track, after which they went back to Petje’s speakeasy and had more drinks. Keayes and Hufeld then headed to Peoria with Heller. The fight reportedly took place around 1 to 1:30 a.m. Sunday, Aug. 28. After the coroner’s jury was presented with the reports of the investigators and the testimony and confessions of Petje, Keayes, Hufeld and Genseal, Tazewell County Coroner A. E. Allen called Martin Virant to testify. What Virant had to say was at least as disturbing and troubling as anything the coroner’s jury had yet heard that day. Next week: Virant’s shocking testimony. The location of John Petje’s speakeasy and the railyards where Lew Nelan was beaten and dumped on the tracks to be run over on Aug. 28, 1932, is shown in this detail from a 1929 map of East Peoria reprinted in “The Heritage Collection Illustrated Atlas: Combined 1910 & 1929 Atlases of Tazewell County, Illinois.” Petje’s speakeasy was in a building, long since demolished, located near the northeast corner of South Main and Center streets.